The first week of school is and always will be very, very full. 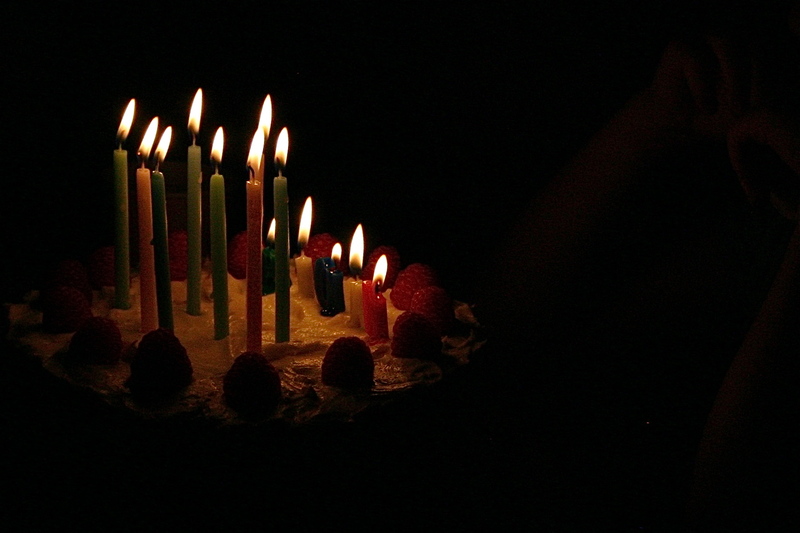 Not only are we wrapping up summer plans, replacing last year’s sneakers and looking for the lunchbox thermos, we’re Celebrating, with a capital “C.” We’ve been arranging and celebrating and playing with grandparents all weekend – our girl is eight. Eight! Our gift (it’s her very own desk – sh!) is waiting to be put into place and I’m so fried, I forgot to pick up its matching chair. But celebrating is so good even if it’s so very exhausting. We’re grateful for new beginnings and love all around. At any rate, I’ve had little time to think about the cabbages in the fridge, which are also waiting. Maybe they’ve been sitting because of our full week but it could also be that it’s so warm and beautiful outside. The Northwest, as it has so many times in years past, is basking in a late summer blitz of warm weather before the chill sets in. I can’t believe that in a few weeks I’ll be raking maple leaves and dragging out the ladder so I can prune the suckers off the crabapple tree in the front yard. Or that soon we’ll all go chasing around in our closets for hats to keep the morning air at bay. 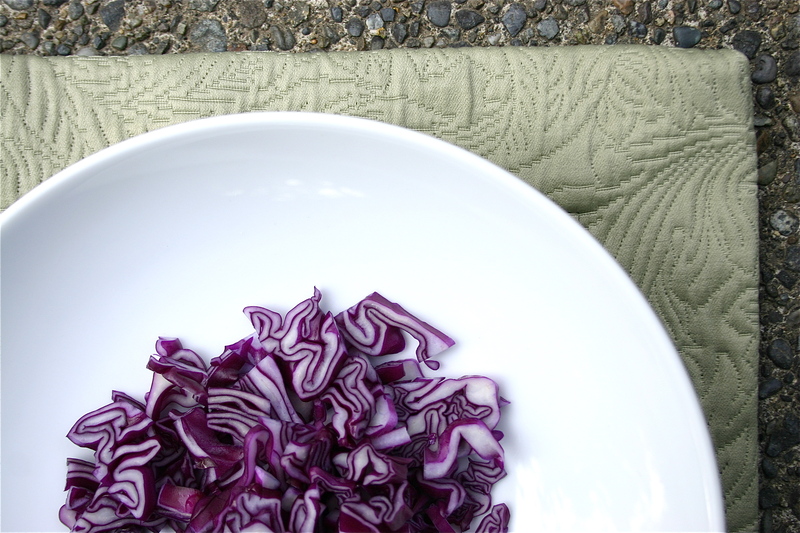 But we’re not there yet so I’m not much in the mood for soup or any other wintry meal that comes to mind when I think of cabbage. I’m still eating stone fruits and thin-skinned squashes. Meanwhile, the onions and potatoes and apples continue to mature, ripen and roll in. And, as I mentioned, we’re overrun with cabbages. 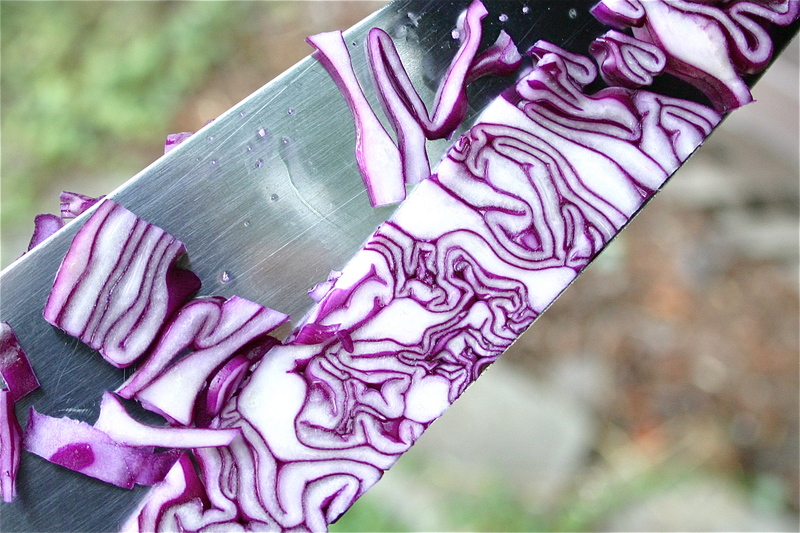 So here I am, doing my best to live in this moment between summer and autumn, chopping up a beautiful head of red cabbage to make a slaw. Don’t these coils and loops look like a summer day? They’re so happy and crisp. And full, just like life. All those leaves packed together then springing open on the cutting board. It’s a bountiful thing. The slaws in this cookbook are tasty, light and free of mayonnaise, a must for a summer slaw if you ask me. I used one of the recipes as a guide. 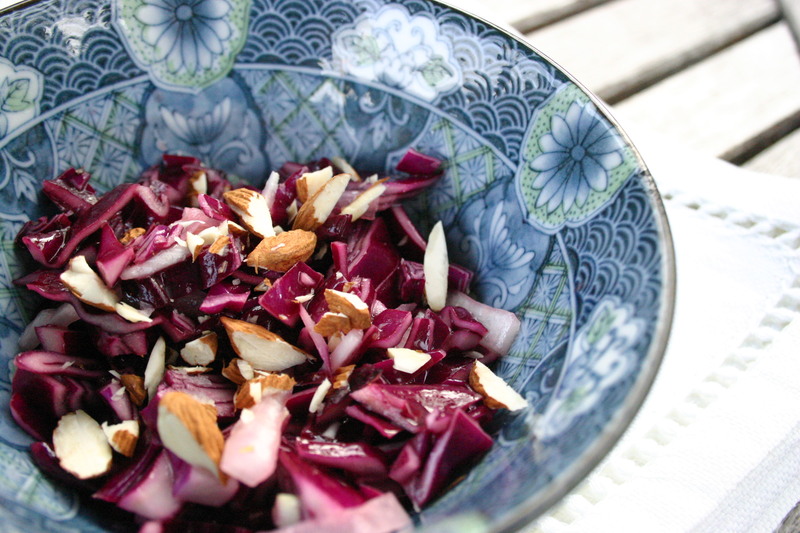 Mine combines red cabbage with a whole sliced onion and a dressing made of toasted sesame oil with vinegars (I used what I had in the pantry, a combination of red wine, white and sherry), Dijon, honey and salt. I’ll let it soften overnight and add a few toasted almonds tomorrow. Then we’ll munch on it all week. I’ll save the other heads for whatever dish is coming our way for Thursday’s post when we’ll see you right back here. Celebrate your last few days of summer well! 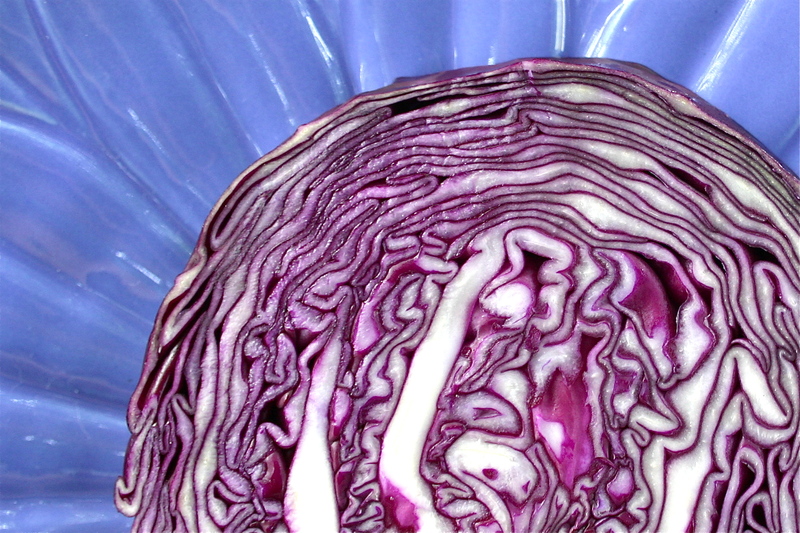 This entry was posted in Fall Vegetables, Recipes and tagged Cabbage, Honey, Local, Organic. Bookmark the permalink.